The phrase "inspired by true events" isn't one that oddly enough, inspires much confidence in me. Sometimes it can be used to pass off a great many cliches and misinterpretations merely because some of the events in the film happened to be based on real incidents. Won't Back Down has moments of inspiration within it, and I think it takes a good step in attempting to use film as a way to bring about discussion about the state of education in the United States. It even has some solid acting from its leads. What it also has is a weak and sometimes lazy script that doesn't do either the actors or the story justice. Jamie Fitzpatrick (Maggie Gyllenhaal) is a single mother struggling to make ends meet while raising her daughter Malia (Emily Alyn Lind). Malia has dyslexia, but her teacher has no interest in helping her in any way. She's been tenured, you see, and thus she cannot get fired. Therefore, Malia's class is pretty much left to its own devices while the teacher is free to ignore them, including not bothering to actually educate them. 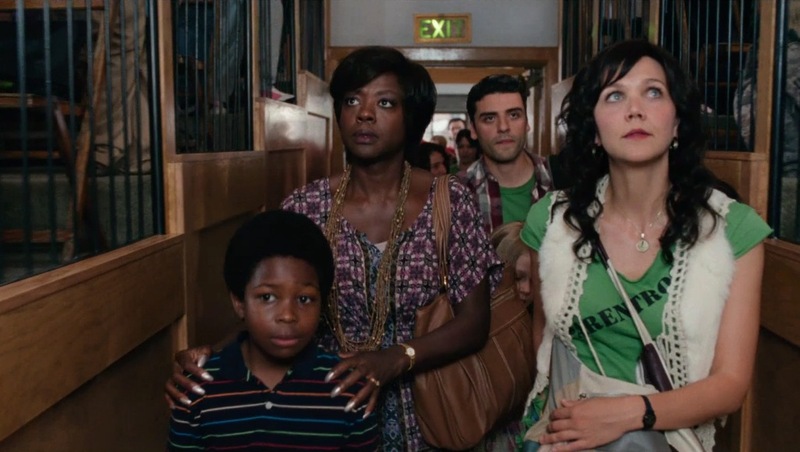 The lack of education in the schools also frustrates Nona Alberts (Viola Davis), one of the few teachers at Adams Elementary that actually tries. She is emotionally drained from fighting the bureaucracy as well as the growing apathy among students and teachers. Jamie is determined to improve her lot and at first attempts to get through to the superintendent, but then learns that there is some kind of loophole that will allow parents to form their own school if enough teachers and parents side with them. With that, Jamie gets a highly reluctant Nona to join her efforts. They have an ally of sorts in another teacher, Michael Perry (Oscar Isaac) who doesn't want to go against his union but who is also starting up a romance with Jamie. The Pennsylvania teachers union is fiercely opposed to any changes and does its best to get the idea of a non-unionized school shot down. Leading the charge is Evelyn Riske (Holly Hunter) who works to show how misguided Jamie and Nona are to oppose such things as tenure and greater union (and lesser parental) involvement. It all comes to a head at the school board meeting. Contrary to what I heard, Won't Back Down isn't completely anti-teachers union. In fact, Michael has a moment where he defends teachers unions and points out the positives unions have had. However, it is by no means a love letter to the unions. In fact, they and their rules and protection of inept teachers are shown to be some of the biggest obstacles to Malia (and all children) getting a better education. Director Daniel Barnz's screenplay (co-written by Brin Hill) can be at times remarkably simplistic in how it portrays some of the teachers. Despite the film's protests, I don't think school administrators are so willing to turn a blind eye towards teachers who simply won't teach or be quick to dismiss any complaints from parents. In fact, it might have helped the film if Bill Nunn's Principal Holland had been more sympathetic to Nona & Jamie's fight rather than be a giant obstacle. What really sells Won't Back Down are the performances, in particular from the two leads. Gyllenhaal has done the gritty working-class broad before, but here, Jamie's enthusiasm and almost innocence in taking on the system because she wants better for her daughter is yes, inspiring. She is matched by Davis, who is in turns both defiant and heartbreaking. Nona's determination to improve the system matches the genuine torment her failed marriage and strained relationship with her son. Isaac is also an actor who here is able to keep up with both as both the reluctant member of their organized efforts as well as Jamie's love interest. It's unfortunate that the script fails them by not making the characters more well-rounded (although the montage of Nona and Jamie facing the growing bureaucratic rules is funny). On the whole Won't Back Down could have been better, but I can't fault it for trying to be inspiring. The performances, in particular of Gyllenhaal and Davis, sells a lackluster script and it's worth watching for them alone. They are able to elevate their material, which in this case, needs elevating. Won't Back Down isn't horrible, nor is it propaganistic, perhaps a bit simplistic in its approach but still worth the effort to get the conversation going.